First of all, we need to thank Vijay; he brought along the Haynes manual at one of the RDD club meets. and lent it to us so that we can take copies. and i cant even begin to explain how much it helped us along the way. hell a lot. anyway so one of those days im looking into the manual, and happened to notice the recommended gear oil details. i was stunned to notice them recommending 10W30 - while we, all this time, were running castrol 20W50. why the hell were we doing this, and why didnt anyone notice? heck, everyone around seems to be running castrol 20W50 on the RD. i call up Jaggu/Tom, and soon we have a discussion. Jaggu explains that climate could be a reason. 10W30 might be suited for US climates, while, for us, a higher grade probably works. anyway we feel that its too much of a difference. in short, what follows is a rather detailed study into different grades of gearbox oil. one point emerges clearly - running stuff like 10W30 brings along a risk of clutch slippage. well, in fact, that was exactly what we wanted to hear. nobody really seemed to mention gear shifting properties while discussing oil grade, but we got what we wanted - clutch slippage. we discuss with Ron, and he raises the same point, and urges us to go for a thinner oil like 10W30. so thats done soon. we get 4 litres of Mobil 10W30 oil, and have a testing session. we encounter no gear shifting problems, without noticing any huge improvement though. but while slow riding at least, gearshifting felt really crisp, especially the downshifts. 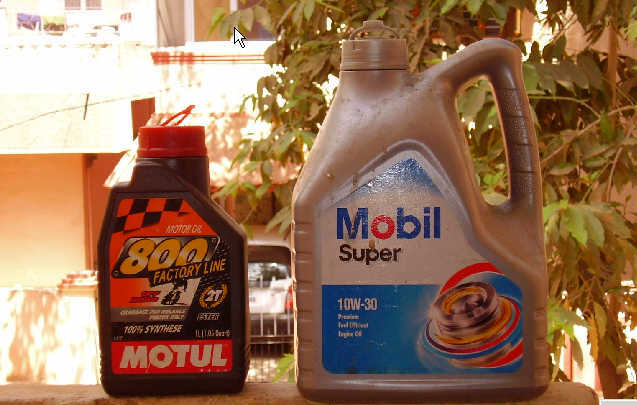 anyway we decide to stick to the decision, and so Mobil 10W30 joins that other trusted oil friend of ours, the great Motul 800.
one simple way to explain the difference between 10W30 and 20W50 is to compare the times taken to pour say 1 litre of oil into the gearbox. the 20W50 is thick, very thick, and flows slow. it takes less than half the time to pour 10W30 as compared to the 20W50 - easily less than half. filling up the gearbox with 1.5 litres of 20W50 actually demands a bit of patience, as most of the time is spend waiting for the oil to drain down the funnel. 10W30 flows bloody fast and is almost like cooking oil. once the oil issue got sorted out, we focused on the basics and ensured that the clutch cable is routed correctly, etc. with a good quality clutch cable, this probably wont be a big issue - but considering the condition of most RD clutch cables available here, even a small bend can cause considerable friction. so routing of the clutch cable is very critical, and often underestimated, we feel. So that brings us to end of just about everything we could do to fix make gear shifting smoother. now it is safe to consider this Stage 10, i believe. those days we were so involved with these clutch related issues, that we never bothered much about the engine or carbs or pipes, etc. it was maybe a mistake, as we realized a bit later. but i think it's really ok - there was absolutely no point in worrying about engine output etc as long as shifting issues remained unsorted. now we can look back and claim that we did a total solid job at that, without leaving any loose ends. At least speaking for myself, as this drag bike story progressed, i slowly found a change coming over me, a gradual change in thought process as well as philosophy of doing things. i was never a perfectionist, as you call it; my way of thinking, as well as doing things, was always of a hurried sort, with hardly any patience or planning. it used to reflect in just about anything that i did - even my work. 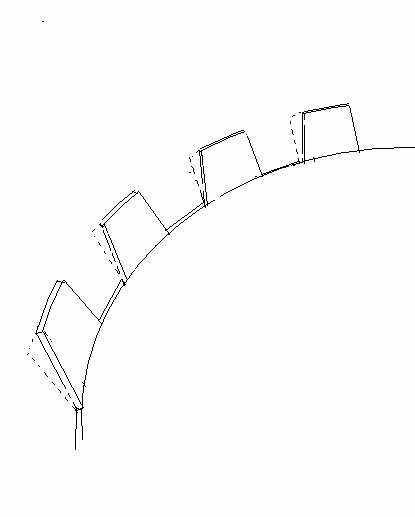 i would get something correctly only over a series of iterations, wasting a lot of energy and material along the way. advantage was that, i would come up with a working prototype very fast - but one that would be extremely buggy, with hardly any thought behind it. and then i would evolve it over a period of time, and get it better. but fundamental design flaws and mistakes would always remain - because those are a natural by-product of any unplanned, thoughtless, creation process. ok so as i said, soon i really found myself changing; i began to appreciate the beauty of pure thought, put well in advance. there was something really exciting about planning something well in advance, analyzing it's various sides, going through different possibilities, counting various elements of possible bad luck, etc. i really began to appreciate the importance of pure hard solid thought - rather than volatile enthusiasm and brute force - while attmpting to do something. few people would believe me when i say that the most i learned, matured, and stabilized in life was while being part of a project which was all about building a stark raving mad moster of a machine whose sole purpose is to take off like a slingshot and burn its was across a quartermile in the least possible time, caring two hoots for pollution or mileage. but that's the truth. life is strange. or maybe we are all mad. time will tell, a few years down the lane. ok now that im done with the philosphy. now, in our RDD forum , there exists a resident genius. and that's Ajith. really crazy chap, and comes up with really mind blowing ideas. he works at microsoft, and i have asked him several times - what the heck are you doing out here, working on databases and that sort of stuff, instead of being in US doing an MS or PHD. anyway coming to the point, a few days before the drag, our man comes up with a clutch mod to enable gear shifting. it's not fair to post his idea out here, but i will post the pic which i drew, which i sent to him just to confirm if i understood his thoughts correctly. as i mentioned above, it really is not fair for me to describe the idea out here - so i will just leave the pic as a teaser of sorts. ok and to add, we never really got time to try it out. maybe, one day, when spares or budget is not an issue, we really need to check it out. so that really brings me to the end of our preparations for the 2005 "bangalore Habba" drag. final testing session over, we parked the bike and settled down to wait out the last few days. not that we were idle, we had entry forms to deal with, medical certificates to procure etc. amidst all this, there was an ominous shadow creeping overhead - literally. the climate started turning murky, with occasional showers. it wasnt a pleasing thought, and slowly we prepared ourselves for a possibly rain washed drag weekend.